What are your plans for Thanksgiving this year? This is the first time in many years that we’ll actually have family in town for the holidays. I can’t wait to host them in our new home in Boston. We haven’t had much time to explore the city yet, so their visit will give us a chance to explore together. I’m also already planning our Thanksgiving menu and starting to decorate. I decided to make this simple cool painted pumpkins DIY Thanksgiving centerpiece to decorate our table for Thanksgiving dinner. 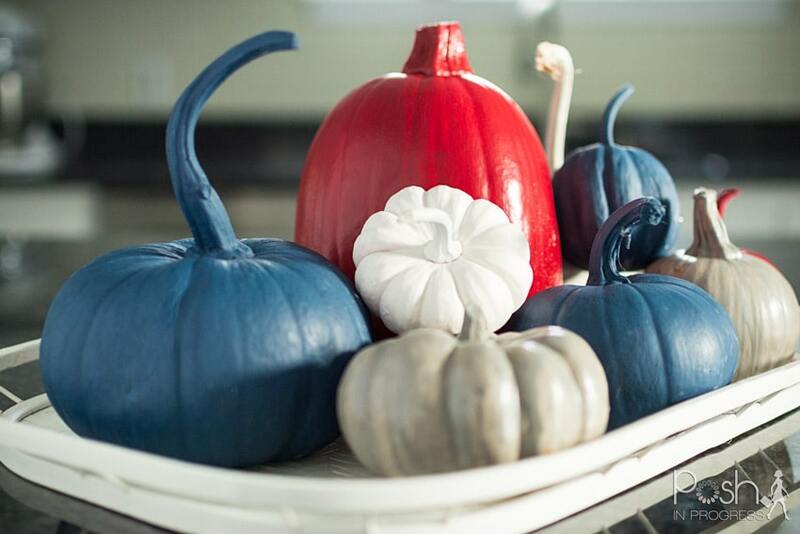 To create this simple painted pumpkins centerpiece, you only need a few items, all of which you can find at Home Depot. 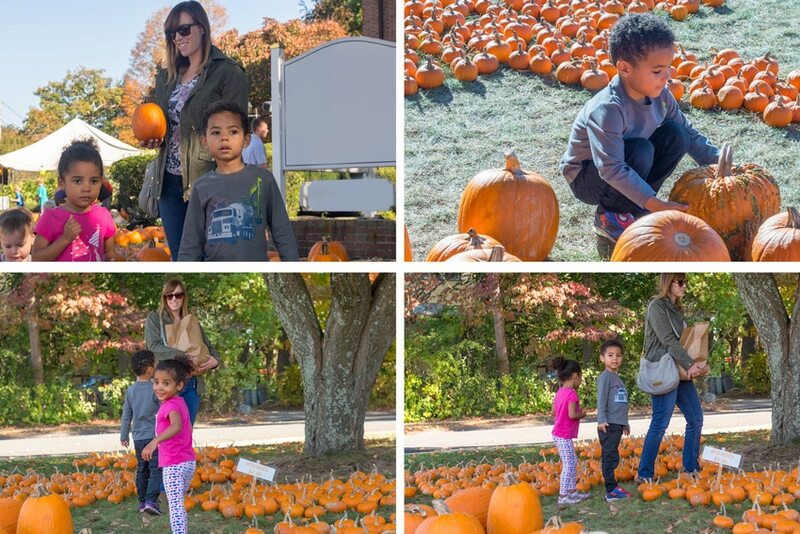 To start, you’ll need fresh pumpkins in a variety of sizes, paint, and paint brushes. That’s it! You can also find a tray, like we did, to display the pumpkins on, but you could just as easily stack them in the middle of your table without a tray, or use a plate you already have on hand. In terms of the paint colors you use, there is no right choice. Since our dining area is a very large black/gray granite island, we wanted colors that would stand out from the dark surface while creating a fall vibe. We chose a vibrant red, a bright-navy blue, and a subtle gray color. Since the walls of our home are a light blue and the kitchen is white and black, we figured the colors would work well for us. Once you buy the paint and pumpkins, I would suggest you prime the pumpkins first. We used a spray paint primer that gave the pumpkins a solid white appearance. It was super fast to apply the primer coat on the pumpkins. Next, we painted 2 to 3 of each pumpkin with the paint colors we selected. We decided to keep a couple of them white to balance all the vibrant colors. Plus, the white goes really well with our kitchen. It took three coats of paint on the pumpkins to get them the color we wanted, but after the second coat, they looked pretty cool too. I love this cool painted pumpkins Thanksgiving centerpiece DIY because it is super easy, something that anyone can do, and completely affordable. Even if you don’t consider yourself a DIYer, I am sure you can do this craft. Also, it doesn’t take very long to create this pumpkin centerpiece. The biggest time commitment is waiting for the paint to dry. It took me less than an hour total to create this centerpiece, not taking into account the drying time. I’m so excited at how cute this turned out. Decorating for Thanksgiving is one thing I can check off my list. But there are a lot of things to prepare for family coming into town. 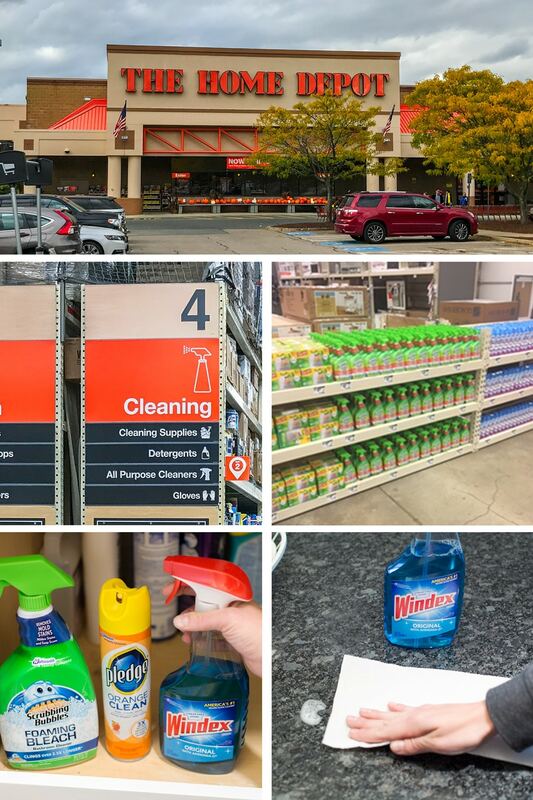 I want to make sure my house is clean and organized, so while I was at Home Depot picking up my supplies, I also stocked up on cleaning supplies. My go-to products are Windex® Original Glass Cleaner, Pledge®, and Scrubbing Bubbles® Fantastik®. Windex® Original Glass Cleaner is perfect for a streak-free shine on glass and mirrors, but it also works great on appliances, counters, sinks and stainless steel. Pledge® works great on wood to beautify and enhance the appearance of hard surfaces. I especially love the lemon clean because it can be used all over the house to clean, condition and protect, while leaving that lemony fresh scent. As I prepare my kitchen for the big Thanksgiving meal, I’ll use Scrubbing Bubbles® Fantastik® because it kills 99% of bacteria and germs while cutting through tough kitchen grease and grime. Be on the lookout for Pledge® product promotions on display in Home Depot stores 11/1/17 through 1/31/18! I definitely feel ready for Thanksgiving, although I know there will be a lot more prep I need to do. I’m glad to know I have my decorations and cleaning on point – now to figure out what we’re cooking. Speaking of which, if you need some recipe ideas, check out these healthy Thanksgiving sides. First, if you have a wooden serving tray like I did, you’ll want to paint that white. 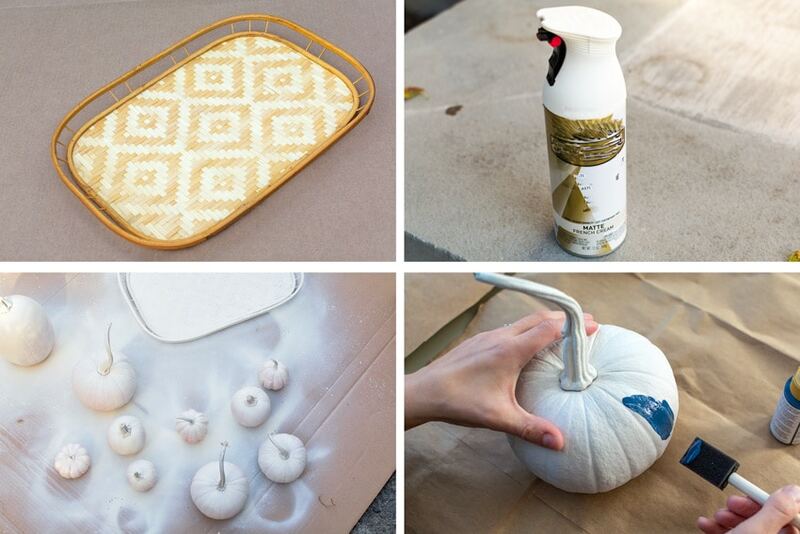 Next, spray all of the pumpkins with the white base coat. Once it is dry, hand paint each of the pumpkins the desired colors. It will likely take 2-3 coats to get the saturated and desired color. Once all of the pumpkins are dry, arrange them on the tray, stacking them and alternating sizes. 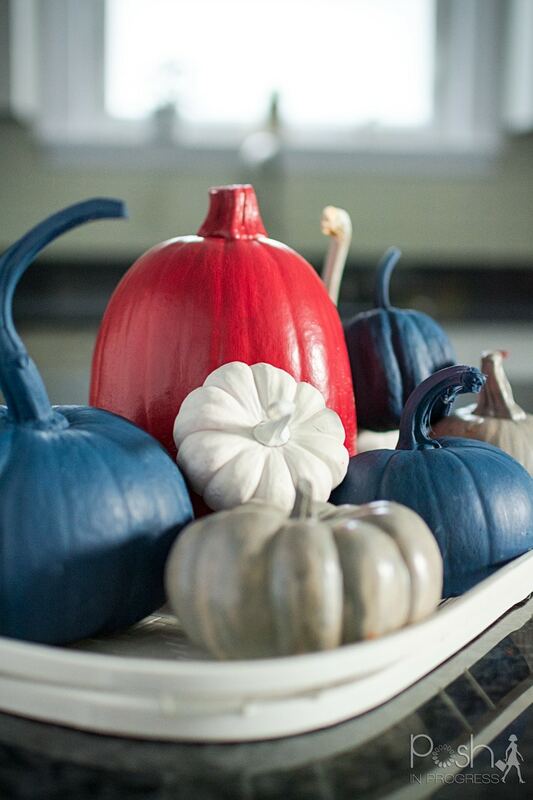 This painted pumpkin centerpiece should last for at least a month or two.